Nostalgic Warehouse’s carefully crafted steel hinges enhance the look of your doors without compromising durability and strength. Steeple finials add a dash or ornate elegance while ball finials add a classic, timeless look. Customize your hinges ever further by choosing between square corners or rounded corners with a ⅝” radius. Residential hinges for lightweight doors are available in 3.5” and 4” sizes while heavy duty hinges are available in 4” and 4.5” sizes and come with ball bearings for additional longevity. 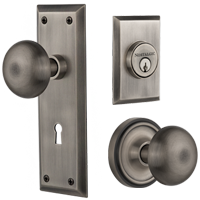 Match your other Nostalgic Warehouse door hardware by choosing between our seven finishes.